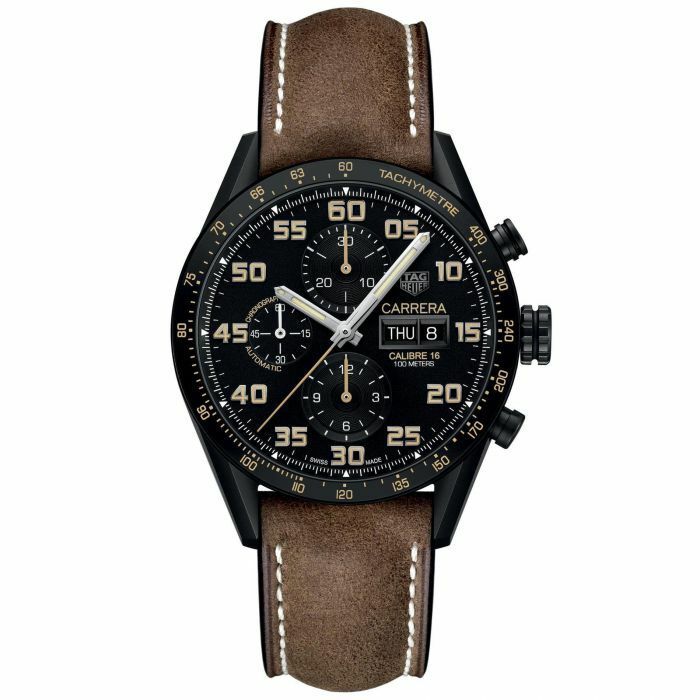 From TAG Heuer, this contemporary sports watch makes a splash in the boardroom or on the racetrack. A modern black dial with three subdial counters, the TAG Heuer logo and "CARRERA" lettering, and a day date window are examples of TAG Heuer's attention to detail that enhance the character of their timepieces. Polished Arabic numerals, hour and minute hands, and subdials add that hint of color to your watch you will love. The 43mm black PVD titanium grade 2 polished case protects the ever reliable, Swiss made Automatic TAG Heuer Calibre 16 movement. Finally, a brown leather strap completes the look and comfortably secures the watch to its wearer with a black PVD titanium grade 2 folding clasp.